cupcakeMAG for Littles: Fashionable Treats for Chic Moms & Their Babes: Medela: #1 for cupcakeMAG & our Littles! 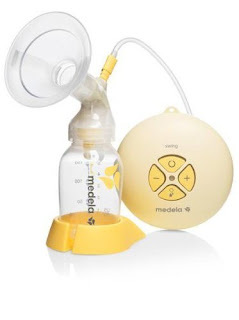 Medela: #1 for cupcakeMAG & our Littles! As a Momma some things are just a must when welcoming your Little into the world. One of those must-haves is the Medela Swing Breastpump. Yes, we know. Never thought a breastpump would be in our "must-have" category but when you are expecting this is just one thing you must put on your list. So how could we be so obsessed with a breastpump? It is pretty simple. The Swing Breastpump from Medela is under $150 which is a major plus for those on a budget. With tabletop, belt clip, and neck/shoulder strap options, it makes mobile pumping a breeze. The drawstring bag is perfect for those who must be organized. It is the perfect place to keep everything super clean and in one place when you are on-the-go or in between pumpings. One of the best parts? All parts that come into contact with breastmilk are BPA-free. This is just a need when it comes to our Littles. And lastly, it is actually really comfortable. We know -- shocking right? Not really. This is one of the best breastpumps we have tried - and let us tell you, we have experimented to say the least with plenty. The Medela Swing Breaspump tops our list! Ready to buy it right? Head over to Amazon.com now and grab it up or add it to your registry for those expecting! Need more info? Visit Medela for all the details on the Swing Breastpump. Oh, and let's not forget Medela Bottles! See our thoughts here! VOTE for Monkey-Toes Shoes Please! current obsession: bugalug plus a giveaway!